Be not deceived with Internet Security and its fake warnings about W32.Blaster.Worm presence on your PC. This is the application bearing the mask of some good anti-malware program whereas it is only meant to scare users into thinking that there is something really wrong with their computers. Then, on this basis, the rogue would offer them to make the purchase of it in order to make the problems removed. There is nothing wrong in purchasing good programs, but this is definitely not the case with Internet Security rogue. When it is inside of your system it reports all files you try to launch as the ones infected with W32.Blaster.Worm. However, Internet Security and its isecurity.exe is the file you must remove. This is the ultimate source of infections on your PC. 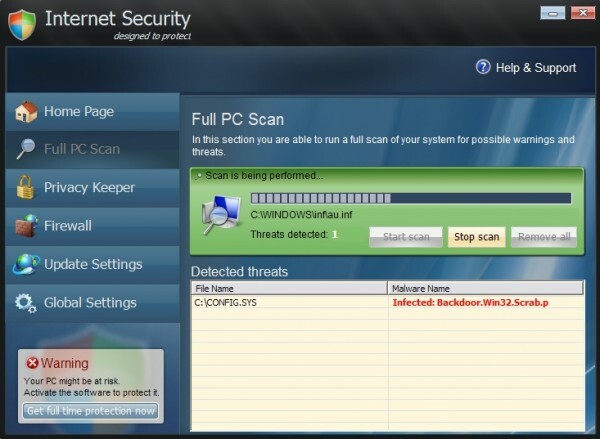 When Internet Security virus gets inside of your system it would immediately run its fictitious and bogus system scan. As it was already mentioned above, the scan would report thousands of infections which are far away from the truth. This means that actually they do not even dwell on your computer. What is true indeed is the fact that most probably this malware is the only virus available inside of your system. For this reason you should not make any payments for it. On the other hand, make sure and delete this malware and scam applications at once, without any sort of hesitation. We have issued this post specifically to draw your attention to the successful removal of this above-mentioned trojan threat. Make sure and dispute all kinds of charges if you have already mistakenly purchased the virus called Internet Security. GridinSoft LLC and GridinSoft Trojan Killer are NOT connected, associated or consorted with the developers of Internet Security rogue anti-virus software. Download the latest version of GridinSoft Trojan Killer to your infected PC, install and run it.